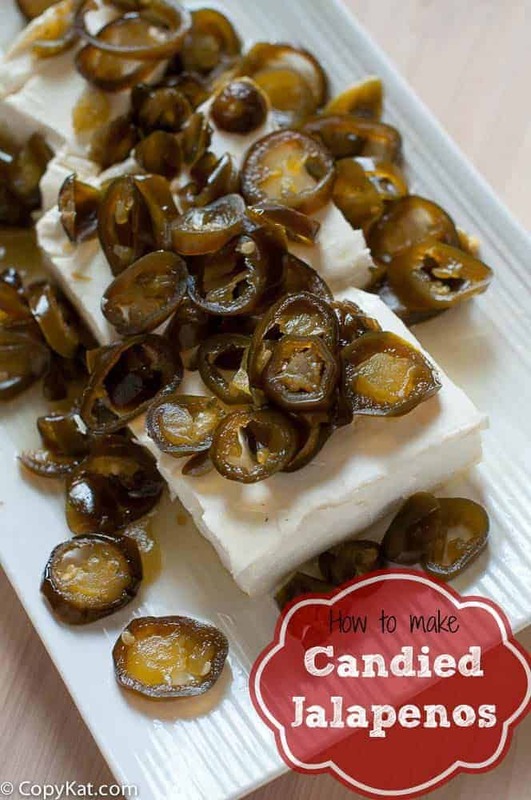 I know you have tried these candied jalapenos before. These are served at parties with cream cheese. Irresistible, yes. Expensive to buy from the store too. Now make them at home with this recipe for easy candied jalapenos. This recipe has just two ingredients, yes two. Maybe I should call these two ingredient candied jalapenos. I was recently at a party over the holidays when a friend of mine mentioned how easy these are to make. She was right. She looked up an old recipe that came out of the Houston Chronicle, and these were quite frankly amazing. I know many stores sell these under names like “Cowboy Candy” or “Kandy Crisp Jalapenos”, and they can be very expensive. You can make these from scratch quickly and easily. This recipe makes so many that you can give these as gifts. I always save glass jars this way when I want to package a few of these peppers up for someone I have something on hand to do so. Of course, you can always buy some small canning jars to put these in, but the old mustard jars work well too. For this recipe, you are going to purchase a large can of jalapenos. Many grocery stores sell these, as does Sam’s and Costco. They may be known as nacho pepper slices or pickled jalapeno slices. You are going to purchase these in the large number 10 can. This can for me was the 6 pound and 4 ounces of the la Costena brand, your can may vary slightly in the weight. These are very inexpensive, for me, this large can be less than 8 dollars from Kroger. This recipe also requires sugar, the plain old white sugar. I also suggest a large colander and a large air tight container. The first thing, you need to do, is to drain the peppers. I opened my can and drained them for about 15 minutes before I continued. You will then dump the jalapenos into a large container and add 5 cups of sugar to the peppers and stir them up very well. You will need to stir the jalapenos every day for the next 5 or 6 days. A spicy sweet syrup will develop, and you will be ready to enjoy these. At this point, you can put these into small jars. You can use these on hamburgers, simply poured over cream cheese as a great snack, or you may even want to put them into a martini. These quick and easy candied jalapenos are perfect for gifts or your own personal enjoyment. These candied jalapenos have just the right amount of spice and sweetness. Drain jalapenos in a large sieve or colander for about 15 minutes. You may need to do this in batches. You can save the drained juice for other recipes. Pour drained jalapenos into a large container that can be closed with a lid, or wrapped with plastic. Pour five cups of sugar over the jalapenos and stir well. Cover container and place into the refrigerator. Stir the jalapenos once a day for five days. On the sixth day you may repackage the peppers into smaller glass jars. Store these in the refrigerator. These will stay fresh for about 60 days. Ive made this and put cream chez on a plate, and cowboy cavier on top, served with ritz crackers, gone likity split. Can you put the peppers back into the jar and add the sugar and stir them in that jar ? Or do you have to put them in another container? plz help making this for a potluck, in pix u have it on top of crackers and crm cheeze,so r u suppose to dip in crm chz and jalapenos. Can this be served at room temperature. U c the party doesnt start till 6pm. Can i take in mason jar, and pour in dish, on top of crm cheese. any suggestions would b greatly appreciated. I am going to dehydrate them when they are ready. Facebook a dehydrating page and everyone raves about them. Did you ever try canning these? I’d like to give them as gifts and do not want them to go bad as they would not be refrigerated. These stay good for a couple of months. I have not tried to can them. The sugar acts as a preservative. If a #10 tin has 6lb 4oz, that’s 100oz. If the recipe asks for 5 cups sugar, that’s 1 cup for 20oz. 2 qts is 64 oz, close enough to 60 oz, so 3 cups of sugar should do. love a math whiz in the group!!! Thank you! I am making smaller batches in the smaller jars. How much sugar for a small jar of Jalapeños? I just filled the jalepeno container with the same amount of sugar. Seems to work fine. That doesn’t mean anything. The same amount as what? 5 cups of sugar no matter how small the container of jalapenos? Patrick, what is a small jar? 6oz? 12oz? 16oz? 24oz? 32oz? The recipe says 5 cups for 100oz. So, use 1 cup for 20oz or 16Tbl for 20 oz or 48tsp for 20oz or about 2.5 tsp per oz. For 12oz jalapenos, you need 30tsp or 10Tbl or 1/2 cup plus 2 Tbl sugar. Thank you for all the good recipes that you create. I have one I wish you could duplicate. It is from the “The Jalapeno Tree Mexican Restaurant” it is called, Mexican fajita dip, and is served with their grilled Specialties. Thanks you, Keep up the good work you do!! I love how you recreate recipes. I am 76, and not much of an adventious cook as I used to be. You inspire me with your recipes and I am certainly going to be using them. I appreciate your recipe for Candied Jalapinos (sp) I bought a small bottle, about the size of a small pimento bottle for $3.00 at a church bizzare. Thank you so much for your recipe. Oh, thank you for your compliment. Do those peppers at home now. You can buy a huge jar at a wholesale club store for very little money. Saw this video on my ROKU, and have made one other CopyKat recipe. Is there any natural substitute rather than the sugar? Like using honey. I am trying to keep my sugar intake in check but also want to make this recipe. I don’t know of one right now, this will take some research on my part. What about using agave? It has the consistency of honey. How much would you use if you substituted it for sugar? I don’t know how this would work, you could give it a try, but to be honest, I don’t really know how much to add, I haven’t done a lot of cooking with agave. The ones i buy are firm and crispy. I tried a different recipe and they had the same flavor but were mushy. Do these stay crisp? These stay crisp as far as I know for about 8 weeks. Can these be heated and then sealed in jars so they last longer ? That’s how I have done the from the first time I made them. can we use fresh jalapenos ? No, you need to use ones that are already pickled. I have seen some like that before, those are tasty. I bought a small mason jar of these for $9 I am so excited that I can make way more than that for less than what I paid. I loved them the first time I had them & can not wait to make these!!!! Forget about that 9 dollar jar. You can make a half gallon for sooo much less. Stephanie, have you ever tried freezing these in zip-lock freezer bags? They sound terrific. I have pretty much just stored them in jars. After placing in the jars do you still store them in the refrigerator? Yes, store these in the refrigerator after you have packed them. These will keep for several months in the refrigerator. I need to check on how to prepare these for canning. Did you try canning these? Thank you. I want to try these.